Ignorance is bliss isn't always a bad thing. Take, for example, driving Peak to Peak Highway and I-70 during a snowstorm. When we headed out at 10AM that Saturday morning with the snow gently falling, we weren't overly concerned, we were too enamored with the beauty of it all. Thankfully, my Minnesota-bred husband is great at driving in snow and naturally took driving the winding, snow covered highway of Peak to Peak with great skill. By the time we got to I-70, the snow had picked up. Everyone on the interstate was caught off guard by the first snowstorm of the season. The interstate was covered in snow, the plows had not arrived yet, no lines were visible on the concrete, trucks were over-crowding the chain stations, and while some cars sought to take refuge at the over crowded chain stations, other cars, like us, tried to keep moving, some better than others. Inch by inch we moved and it seemed like all the cars around us were participating in a slow motion ice dance over and down the mountain. I would think you would be able to YouTube a video of "The Blue Danube Waltz" being played as cars did this dance. You know, they slide to the left, spin to the right, trucks taking baby steps forward while others rush the audience. If you found that then you could share in our experience driving over the pass that day. Well, maybe it was more like Elaine's dancing over and down the mountain but still, you get the picture. :)! All in all, it took us twice as long to get to Vail for our lunch stop, but we were all incredibly thankful for our safe passage there considering all we had just seen. By the time we were back on the road, we experienced the awesomeness that is snow melt in Colorado. The snow was already melting on the roads, the clouds had passed, and the sun was beautifully shining. From then on, the driving conditions were completely normal, like it had never even snowed. Driving down the west side of the Rockies was the beginning of all new experiences for me until we reached San Francisco. The terrain of the west side of the Rockies is incredibly different than the east. All of us were once again in awe of our surroundings as red rock walls replaced the gray rock walls of the east side. Then there was the winding roads, the tunnels for holding your breath (driver not included), and the beautiful rushing Colorado River... amazing. 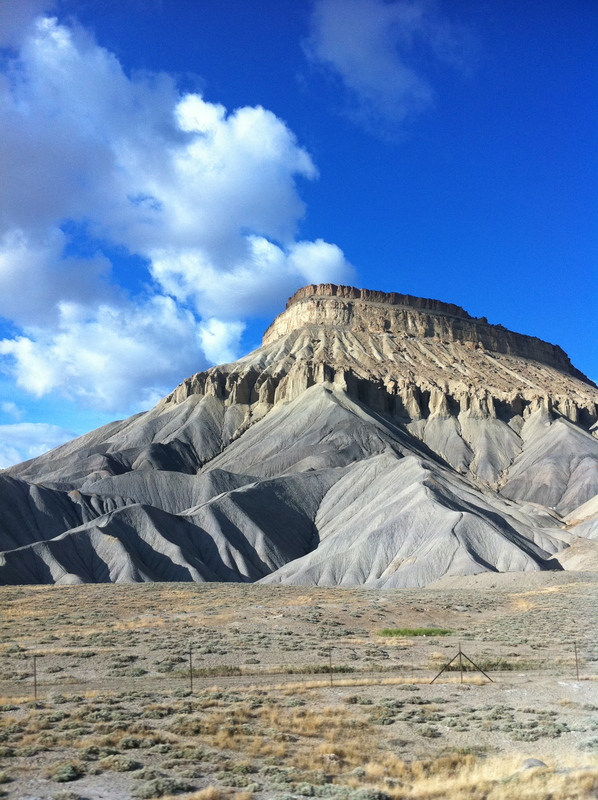 We finally felt empited out of the mountains when we came upon the beautiful sandstone Book Cliffs by Grand Junction. Our EP friends told us about the "back road" to Moab through Cisco and how even though it is a tiny bit longer, you will not be sorry. Wo/man, were we glad we took their advice! The back road, i.e. Highway 128, continues to take you right along the Colorado River. It twists and turns, as rock formations begin cropping up on all sides, antelope are jumping across the plains, and tall towers of red entrada sandstone show up seemingly out of nowhere. It was hard to tell if the red canyon walls were growing taller or if we were shrinking lower as we made our final approach. We were racing a magnificent sunset, but were not fast enough and it was the canyon's turn to empty us into a now dark town of Moab. We made it to our hotel, ordered delicious Paradox Pizza and PBRs, and settled in for our two night stay in Moab. Wait... Pizza and a dairy allergy? Yep. By now, we were a year into living with a dairy allergy and knew some questions to ask to make certain the pizza we order has no dairy - besides asking for no cheese. Most crusts are dairy free, though you need to ask them if they put butter on the crust for baking. Most sauces are dairy free, though you need to make sure they don't put grated parmesan in their sauce. Most toppings are dairy free, though some Italian meatballs/sausages have cheese added or milk as a binder. But, it is totally easy otherwise... until you don't ask. 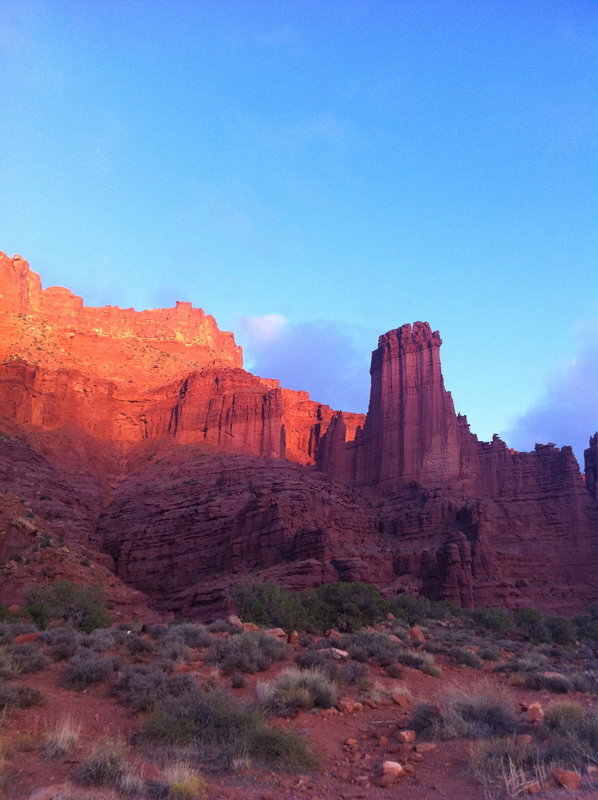 As we went to bed that first night in Moab, I was once again overwhelmed with thankfulness. Thankful for another safe trip, thankful for the amazing beauty we got to experience, thankful for the gift of my family... but I was most thankful for a pause in the intense insanity of the previous year. The snowstorm was truly nothing in the grand scheme, (we weren't being blissfully ignorant after all, :)!). We were given a beautiful gift during our travel days to spend time focusing on our hearts, our relationships, without all of the insanity distracting us.